Having read Bernanke’s essay, on the US financial crises of 2007-2007, as relayed in the Book by Ben S. Bernanke: The Courage to Act and, which is reviewed here by Dr. Sheila Vegari, a member of the Institute of Economic Policy Studies, led me to go back and reread an the excellent book by John Kenneth Galbraith with title “The Great Crash 1929”. A common phrase used by so many and repeated so often states: History repeats itself”, or does it? This thought stayed with me while reading the excellent summary of Ben Bernanke’s book: “The Courage to Act” not an easy book to read, but hard to put aside. Having invoked the thought I need to explain. While studding for the PhD in economics “way back”, one of my reading was a book written by John Kenneth Galbraith with the title “The Great Crash 1929” published by Hamish Hamilton (London: 1955). It is a very powerful book, remarkable in the way it makes one feel while reading it, that whomever said: History repeats itself was not only right but a person of vision. 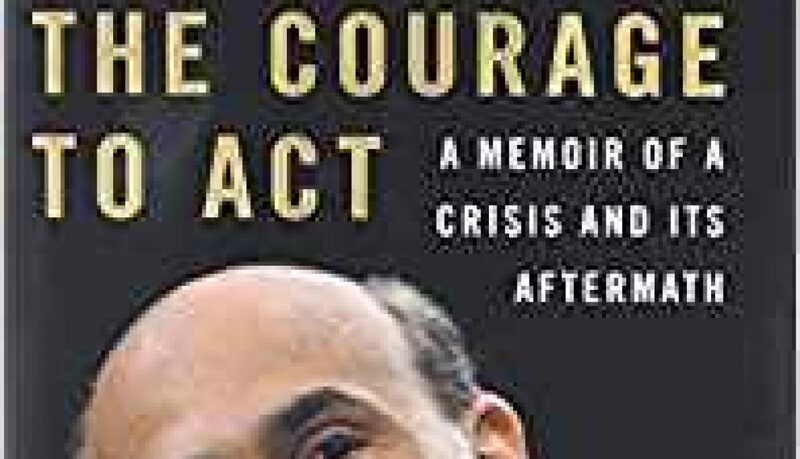 Ben Bernanke’s book, The Courage to Act, published in 2015, some 60 years later tells not a dissimilar story. Economies now and then experience what some in the 21st century would have thought unthinkable—a collapse in the functioning of their economies. But then all turns out for the best: the crisis most often enhances the economist’s understanding as the saying goes of “how the world turns”. Galbraith wrote: “It has long been my feeling that the lessons of economics that reside in economic history are important and that history provides an interesting and fascinating window on economic knowledge” (p.14). How true! Ben S. Bernanke’s book takes the reader step by step through the financial crisis of 2007-2008. Not since the “Great Crash of 1929, did the United States economy suffered not only, a loss of output but most importantly of confidence in its financial institutions. Not unlike Galbraith’s book,: The Great Crash of 1929, where Galbraith takes the reader through events which compelled policy makers to act, Bernanke’s book take the reader through the process itself, from institutional failure to act, contemplation of needed to be done ,leading to a call for governmental actions. Dr. Vegari, in reviewing Bernanke’s book, takes the reader, through the crisis as relayed by Bernanke and summarizes the process that The Federal Reserve along with the US Treasury had to undergo to get the economy back on the recovery track. Unlike Galbraith’s book on the 1929 financial crises, a book of 189 pages, Bernanke’s book consists of 579 pages—one age as times goes by, and so is everything else! There are similarities as well as contrasts between the two crises. In this space, a summary of the2007-2008 crises and the actions taken to get us out of it, as relayed to us by Ben S. Bernanke is put forth. In a follow up piece, a presentation of Galbraith” the Great Crash of 1929 will be made. The reader will then have the opportunity to judge for himself: Does history repeats itself? Better yet how much have we learned! d detailed overview of the US financial crisis of 2007-2008. The review gives an exhaustive account of efforts, as well the innovating policies that he and his team have implemented during the “great” recession of 2007-2009 in order save the financial system from collapse, and to prevent the economy from sinking in to a “depression”. Readers in general and Student of economics in particular most likely would enjoy reading this book, as well as appreciate the colossal magnitude of the crisis, in particular Bernanke’s full understanding of the effects of monetary policy decisions on the economy. The book is without a doubt a historical documentation of how the crisis started, the extent of the damage done to the economy, and it tells a compelling story of the collapse of some of the biggest financial institutions in the United States. In putting forth the magnitude of the crisis and the endless efforts exerted by him together with others, most notably Henry Paulson, and Tim Geithner along with the other members of the Federal Reserve, one cannot but appreciates Bernanke’s frustration with existing policies that, in his view were outdated and, the lawmakers’ “slow” and “inefficient” decision making process for approving a new bill. To appreciate Bernanke efforts in dealing with the crisis, in particular the slow process of addressing the existing problem, below is a brief background of Bernanke, especially in so far as they impact his policy actions in addressing the financial crises. Ben Bernanke was raised in Dillon, South Carolina. He attended East Elementary School, and Dillon High School. In 1971, he enrolled at Harvard University where he developed an interest in the study of economics after taking an economics course taught by Martin Feldstein. While there, his mentor, Dale Jorgenson was instrumental in teaching him how to build and use mathematical models of the economy, not only to understand how the economy works, but also forecast the effects of policy on its path. He attended the PHD program in economics at MIT. At that time a “new” classical theory became very popular spurring debates between Keynesians economics (the traditional economic thought of the time) and the new classical thought. As he puts it, the teaching of Stanly Fisher’s (Macro Economic Policy and Monetary Policy) influenced his own thinking about economic philosophy. As he puts it: After reading the Monetary History of the US 1867-1960, written by Milton Friedman and Anna Schwartz which was recommended to him by Stanley Fisher, he became very interested in the study of the Great Depression and its causes. This led him to undertake an extensive reading and research on the subject during his studies of the Ph.D. program in economics, as well as during his 6 years of teaching economics at Stanford University. His research led him to argue that during the Great Depression (the 1929 Crash) which resulted in the collapse of the banking system, the lack of credit availability for the financial institutions played a very significant role in the crisis. His study of the financial crisis led him to argue that in “every” severe downturn in the economy and banking crisis, insufficient credit played a significant role. In 1985, Bernanke accepted a full professorship at Princeton University. There, his research focused on the effect of monetary policy on the economy. It was during that period that he introduced the “inflation targeting” idea as policy tool of monetary policy. Years later, the US Federal Reserve adapted inflation targeting as a major tool in choosing the direction of monetary policy. Bernanke went to became the chairman of the Princeton economics department in 1996, remaining there until early 2002 when he was appointed a member of the Federal Reserve Board (he calls it Maestro Orchestra), under the chairmanship of Allen Greenspan. From academia to the heart of policy making was quite a change– from his quiet, not too eventful academic life, to the policy making arena. At the Federal Reserve, as Bernanke puts it, he and Greenspan did agree on certain policy issues, such as the Federal Reserve’s independence, viewing monetary policy as a strong policy tool, on making nonpartisan policy decisions, and, believing in low inflation policy. However they differ on other issues such as the financial system regulations, the Federal Reserve’s transparency, in particular on an inflation targeting policy which Bernanke advocated. In effect, Bernanke gave a number of speeches promoting his idea of inflation targeting policy while the economy was in a downturn in 2003. He believed that if the inflation target was accepted by the people and the financial market, the Fed would have a better chance of influencing the path of the economy during the recession, because they will know the direction of the Fed’s policy and hence modifying their actions accordingly. In June 2005, Bernanke was appointed as chairman of the President’s Council of Economic Advisors during George W. Bush administration. And later on, in February 2006, he was appointed as the Chairman of the Federal Reserve, serving a second term under the Obama Administration. According to Bernanke, the crisis of 2007-2009 was one that was triggered by a fast growing housing market. This boom seems to end following the collapse of housing prices, and the fall in housing construction. The housing bubble was said to be the result of an “irresponsible” mortgage lending activities taking place in the subprime mortgage market. It was argued; that lending was not based on how much institutions have deposits as was the common practice in the past, rather banks were able to sell the mortgages to a third party, the third party would then package them and sell them to investors . This process is called securitization. Accordingly, investors were able to mix different mortgages with different degrees of risk and sell them to variety of investors depending on their risk preferences. Therefore, they were able to attract a lot of investors globally and a great deal of fund was invested in these securities (MBS). In these arrangements, the original lender no longer held the loan, and was not responsible for it. The packaged securities were rated by the organizations paid by the issuer of the securities to rate them higher, and sell them domestically or globally. Meanwhile, the brokers, in order to lend more, had to soften the financial requirements for obtaining a loan for the purchase of a house. The strategy worked so long as the housing prices were rising and no expectation that they may fall. But, they did fall and a large number of people, especially the subprime borrowers defaulted on their loans. Such default had a rippling effect on the mortgage backed security market. The securities lost their values, and consequently turned into financial “nightmares” for home owners—those owners of mortgage backed securities as well as for those financial institutions that packaged and sold the mortgages. “If a hurricane knocks down a house, you can blame it on the strength of the hurricane or on structural deficiencies. In the end, both factors, matter. A destructive financial crisis is analogous to a hurricane. Clearly, there are causal factors, or triggers for the occurrence of a hurricane. But the triggers cannot cause extensive damage without structural weaknesses– the vulnerabilities of the system itself- a house with a weak foundation”(p.83). On June 2007, two hedge funds run by Bear Stearns which had invested heavily in mortgages, incurred huge loss, filed for bankruptcy despite receiving a $1.6 billion loans from Bear Stearns. Bank of America who had guaranteed some of their assets for a fee, lost about $4 billion. On July 2007, the subprime losses, transmitted overseas, brought down some of the banks to the verge of bankruptcy; no institution was willing to lend them. In August 2007, BNP, the largest bank in France announced that they will no longer allow their costumers to withdraw fund from the investment fund accounts that held securities by American mortgage backed securities, because they had no way of determining the value of the securities. These events created panic around the world and initiated more security selloff which caused more loss of value and more fear. Financial institutions were not willing to lend each other money any more. Use of commercial paper, and Repos, which was the customary way of obtaining credit and loan for financing their debt, was not easy because of the nature of risky securities. Given that the Federal Reserve is viewed as the lender of last resort, Bernanke, attempted to use its discount window to make credit available for those institutions in dire need of fund. The problem was that use of the discount window was outdated, financial institutions mostly relied on shadow banking to obtain credit. US banks were reluctant to borrow from Federal Reserve in fear that to do so may damage their reputations. Other efforts by the Federal Reserve, designed for making loans more attractive to borrowers, involved cutting the interest rate by one- half, and extending the term of credit by 30 days, with possibility of renewal. In addition, the Federal Reserve together with the Federal Deposit Corporation (FDIC) sought temporarily permission for the non- bank subsidiaries of the major bank to use the discount window. In addition, the Federal Reserve began gradually to lower the Federal Fund rate (The Federal Fund rate is the interest rate that banks charge each other for overnight loans). Federal Reserve can manipulate the rate by changing banks reserves holding from buying or selling government securities in the Open Market. From September 2007 to December 2008, the Federal Reserve gradually reduced the Federal Fund rate from 5.25% to between 0.00% and -0.25%. On March 2008, Bear Stearns, one of the largest investment banks, and brokerage firms in the US, with nearly $400 billion in asset was heavily engaged in mortgage and securitization, acknowledged their financial difficulties, hence their need for fund as they were in the verge of bankruptcy. Bernanke and his team believed that Bear Stearns failure will most likely exacerbate the crisis, thus creating a panic in the market. Bear Stearns had 400 subsidiaries, highly interconnected with other financial institutions, and some 750,000 open derivatives– the firm under TITF categories, is “too interconnected to fail” Fearing the collapse of Bear Stearns and the repercussion on the market, the Federal Reserve ended up announcing their “unusual and exigent circumstances”, and in light of the new application of 13(3) of the Federal Reserve Act, they extended emergency funds equal to $30 billion to Bear Stearns. Of note is the fact that since 1936 did the Federal Reserve used its authority to extend credit to an enterprise. However, the loan had but a temporary effect; it could not save it. Subsequently it was bought by JPMorgan at a price of $10.00 per share (the pre- crisis price was $133.2 per share) through loans from the New York Federal Reserve. The failure of Bear Stearns is said to have started the melt down in the large financial institution. Looking back on the attempted pail out of Bear Stearns, Bernanke of the view, that the Federal Reserve did the “right thing” in its attempt to save the company, especially in view of the negative consequences brought about by the subsequence failure of Lehman Brothers. The financial crises hit the housing market particularly very bad. With home prices falling, the number of foreclosures rising, the value of mortgage backed securities sharply dropped. The Federal Reserve believed that more institutions, most likely will experience financial difficulties, with a high probability of bankruptcies. Concerns were voiced about the “bad” performance of the Government Sponsored Enterprises (GSEs), Fannie Mae and Freddie Mac, the two largest holders of mortgage backed securities globally. These enterprises were initially created by the federal government to promote housing ownership in the US. Subsequently, they were converted to privately owned corporations, subject to government regulations, enjoying the benefit of state and local tax exemptions and a line of credit from the treasury. Their purpose was to purchase mortgages from the banks, package the securities, and sell them to variety of investors, which included foreign Central banks. The securities of these enterprises were deemed safe and highly liquid next to treasury securities. GSEs financially guaranteed these mortgages for a fee. During the housing boom, these enterprises were very successful attracting a great sum of foreign savings to the US housing market. However, given that the US government had not guaranteed these securities, they were viewed to be quite risky. This turned out to be the case when the housing market collapsed. Subsequently, their stock prices dropped sharply and over one week the value of their portfolio dropped by one half. To lend a “helpful hand” temporarily, the Federal Reserve, agreed to let them borrow from the discount window, in the anticipation of a government bailout– until it came up with a legislation to save the GSEs. Indeed, a bipartisan legislation was passed on July 2008 given “unspecified authority” for the administration to purchase the securities of the GSEs, for GSEs to have a stronger capital requirement and give the Federal Housing Administration the power of oversight over the GSEs. The Lehman Brother’s case was the most controversial one. According to Bernanke as well as others notably Henry Paulson, the company’s financial status was deemed “not hopeful for being salvaged”, either by receiving loan and credit or through acquisition– taken over– by another company. Not unlike other institutions, Lehman was desperately in need of short term credit. Although the company had access to funds from the Federal Reserve using their Primary Dealer Credit Facility- the borrowing tool which was developed after Bear Stearns failure, Lehman elected to limit its borrowing, accessing the Federal Reserve funds only a few times for fear that the firm reputation might suffer. Of note is the fact that Lehman had some $639 billion in low quality assets which no buyer was willing to acquire. The Treasury Secretary, together with the Federal Reserve, tried hard to persuade other institutions, including Barclay Bank and Bank of America to take over Lehman, but their efforts did not pan out. Although such institutions did show interest in the deal, they refused to act once the value of Lehman’s assets became known. Since, the US treasury was unwilling to use taxpayer’s money to bail Lehman out; it had no options but to file bankruptcy on September 15, 2008. A great deal of questions and controversies arose over the decision of the federal government’s failure to rescue Leman but lend a helping hand to Bear Stearns. As relayed by Bernanke, there was absolutely no way that they could have saved the company. Lehman was a much larger bank with large assets including a great deal of risky assets in its portfolio. The management was in a state of denial for long, thus refusing to pursue any “recovery” action. Moreover, unlike the Bear Stearns case, no buyer was willing to take the “huge” risk acquiring its assets. At the same time during Lehman’s crisis , Merrill Lynch , another large wealth management company had been for a while experiencing financial difficulties with its mortgage backed securities, and was also seeking help. However they were in a better financial position. In the same weekend that Lehmann filed bankruptcy, Bank of America bought Merrill Lynch. During the eventful weekend of “hurricanes Lehman and Merrill” as Bernanke puts it, there was a stronger and wilder, hurricane developing, named “hurricane AIG”. AIG the largest insurance company in the world with 130 subsidiaries, and $1 trillion insurance operation, was asking for loan. AIG did not have problems with its current insurance operations. One of its subsidiaries, AIG Financial Products, or AIGFP, had insured many US and foreign consumers that had extensively invested in mortgage backed securities, and they were to cover all their losses above a certain amount. Through another subsidiary however, it had invested large amount in private mortgage backed securities whose values were “evaporating”. These institutions were urgently in need of large amount of cash to keep them afloat. The Federal Reserve was not obligated to help AIG, for it was not regulated or supervised by the system. However, there was strong belief among many that if “AIG is too big to fail”, and, “if it did”, it will bring down the financial sector and with it the US economy. The argument was made that it needed to be saved because of its “interconnectivity” and “enormity”. Having apprised of the enormity of the problem, the Federal Reserve had no option but to lend a helpful hand; extending a line of credit equals to $85 billion, an estimate of how much AIG needed at that time. Subsequently, in the following quarters, because of further losses, AIG secured additional bailout. The overall funding received by AIG from the Federal Reserve and the Treasury Department totaled $182 Billion dollars. The financial crisis was still brewing as the Federal Reserve and the Treasury was putting out the fire, more US banks began having liquidity problems. Wachovia bank was looking for a buyer; Goldman Sachs and J P Morgan, on a daily basis were having hard time trying to obtain liquidity. With the widespread of financial stress in the financial sector, both the Federal Reserve Chairman and the Secretary of Treasury came to the conclusion that they could no longer address the problem without additional help from the Federal Government and Congress, although Congress was reluctant to approve the use of taxpayers’ money to bail out the big banks. In his three page proposal to Congressional leaders, Paulson asked for $700 billion for purchasing the troubled assets, by way of acquisition, with maximum flexibility in the use of the fund. The proposal was named TARP: Troubled Asset Relief Program. .
As was expected, even though the proposal was agreed to by the President, it faced opposition from both the Republican and the Democrat law makers in Congress. People were against bailing out Wall Street at the expense of Main Street. Paulson with his Wall Street deal making talent was in constant negotiation with Congressional leaders. Finally, very early on September 29th, 2008 agreement was reached among various constituencies, and, the bill was submitted to the Congress. Unfortunately, it did not pass initially even though both party leaders had agreed to it. With that the Dow Jones Industrial dropped 778 points. Bernanke points to the fact that due to sharp drop in Dow Jones, the values of 401(K) and 201(K) accounts dropped sharply, which induced congressional leaders, to re-evaluate their position and vote again on the bailout. This time around, the Senate did pass the bill with 74-25 vote on October 1st, and, on October 3rd, 2008, it was passed by the House 263-171. Towards the end of 2008, as it was anticipated, the financial crisis became more of an economic crisis. The financial system problems led to a sharp decline in consumer demand for product, along with lack of new investment, resulted in high unemployment and low production. As Bernanke puts it, “with the economy still on a free fall and short term interest rates already near zero, the economy certainly needed fiscal help”. Shortly after President Obama took office, and following the Keynesian economic recommendation, that during recessions, government spending should increase to offset the fall in private spending, the President signed an expenditure bill of $787 billion. The bill is referred to as the “American Recovery and Reinvestment Act of 2009”. It included $288 billion in tax cuts; $144 billion in aid to state and local governments, the remainder was to be allocated for “extended” unemployment compensation, and infrastructure spending. To evaluate the impact of such an infusion of public spending on the economy, Bernanke argues that it did indeed provide some helped in slowing down the process of economic contraction, although other economists believed that it was too small for stimulating a 15 trillion dollar economy. In an effort to mitigate the downward effect on the economy, Obama instituted a program named “Making Home Affordable”, having two parts for reducing mortgage foreclosures. One part of the plan, which was called the Home Affordable Refinance Program, or (HARP), was designed to help the group which had suffered income loss, but still were paying their home mortgage. This program was designed to help those household in refinancing their mortgages on better terms. The second part of the Program was called, the Home Affordable Modification Program (HAMP) which would help those who already had lost their homes. TARP funds were designed to use to pay for HAMP. Bernanke, make the argument that there was always fear that TARP money may not be sufficient to cover bank losses. When Geithner became the Treasury Secretary, he became in charge of disbursing these funds. To insure efficiency in the distribution of such funds, he suggested the application of what is referred to as the “Stress Test”, to be imposed on banks with capital of over $100 billion. If the banks’ financial status, were to fail the stress test, they would have to seek private sources of fund. However, if they were not successful, then the government would use the Tarp money to help them. The stress tests turned out to be very difficult for the financial institutions. However, they did inspire the public’s trust in the financial system after the results of these tests were announced. Of the nineteen (19) institutions, ten (10) needed extra funds, but only eight (8) were able to secure funds through private parties. GMAC were the only institution funded ($3.8 billion) from the TARP capital. “Based on the historical parallels, I believed then and believe now that the severity of the panic itself-…..was responsible for the enormous financial and economic costs of the crisis. …..our policies drew heavily on classic prescription for fighting financial panic, and they ultimately eased the crisis” (P.398). He describes “panic” when a run on few institutions creates fear among depositors as well as financial institutions, as they fear the loss of their deposits. Such fear clearly leads to a domino effect on other institutions. When such event takes place, the most dangerous outcome is when depositors were to withdraw money leading the institutions to do what is referred to as a “fire sale”,which in turn, reduces the value of their assets. Bernanke further argues that the failure of the risky mortgage backed securities that started in 2007 together with the overwhelming market fear, led to the fire sales of the securities, cash hoarding, and lack of credit, bankruptcies, and home foreclosures. The crisis caused job loss of 6.2 million people between early fall of 2008 and June of 2009. In addition, both households’ consumption and Capital investment dropped sharply. He adds his interpretation of the events, by stressing that, the heightening magnitude of panic was the major cause of what he termed the “Great Recession”. Bernanke goes on to outline his major policy tools during the 2007-2009 crises. He states, that his policy revolved around finding the mean to provide liquidity to the failing institutions, to avoid the repeat of 1907 bank runs and the great depression experienced back then. Some of the tools used to address the crisis were quite innovative. The Federal Reserve, not only tried in every way to provide liquidity to the financial Institutions within US, but also made extensive efforts to coordinate with foreign Central Banks in order to stabilize their financial institutions and fight the crisis. Bernanke states:” frantic autumn of 2008 had tested the methods and skills of the staff and leadership throughout the Federal Reserve System”. Term Auction Facility (TAF), auctioning discount window loans for longer term than just overnight. Primary Dealer Credit Facility (PDCF), allowing other non- bank primary dealers borrow from the Federal Reserve. Term Security Lending Facility (TSLF), which offered Treasury’s general collaterals to the primary dealers in exchange for other acceptable collaterals. Currency Swap Agreement: the Federal Reserve provides dollars to the European Central banks, with the repayment collateralized by Euros. (This would make it easier for the ECB to provide dollars to their own banking institutions). Commercial Paper Funding Facility (CPFF), a system created by Federal Reserve to buy unsecured and asset backed commercial paper from eligible issuers. Asset Backed Commercial Paper Money Market Mutual Fund Liquidity Facility, to provide loans to the depository institutions and affiliates to finance purchases of asset backed Commercial Papers from Money Market Mutual Fund. Term asset Backed Securities (TALF). The Federal Reserve would lend to investors, for term up to 5 years to purchase triple A securities, with collateral such as, student loans, and commercial Mortgage loans. A third set of instruments the Federal Reserve utilized was its standard Open Market Operation to lower the long term interest rates to encourage long term investments. Such instrument is referred to as QE or quantitative easing (QE). Below is a description of how it works as well as its effectiveness as a policy tool. Even though the financial panic had subsided, its devastating effect was apparent in every corner of the US economy. The unemployment rate was up to 10 percent by October 2009, 5.6 million homes were foreclosed, and 25 percent of home owners’ mortgage loans were more than the value of their houses. Short term Interest rates had bottomed out. Given these dire consequences, the Federal Reserve had run out of options but to come up with new and innovative although highly controversial policy tool (at the time). Initially referred to as Large-Scale Asset Purchase LSAP, the media kept referring to it as Quantitative Easing (QE), hence the name stuck. The purpose of QE was to buy large amount of long term treasury securities, in order to bring down the associated interest rate, which in turn, would bring down the rate in the market with the same maturity date, such as the corporate bonds rate and the mortgages rate. The argument behind QE is simple: when the cost of long term borrowing is low, people will be encouraged to invest long term, hence a positive impact on the economy. The first package, QE1, was designed to get the market attention and, according to Bernanke it did. It called for: an increase in the 2009 purchases of mortgage backed securities guaranteed by Fannie and Freddie securities, Ginnie Mae, mortgage backed securities guaranteed by FHA and mostly include first time home owners or lower income new mortgages to $1.25 trillion; a 200 billion dollars for the purchase of Fannie and Freddie’s own debt issues; and 300 billion dollars of treasury securities. The Federal Reserve also announced that they will keep the federal fund rate at the same level for a long time. The aggressive policy designed by the Federal Reserve had a great impact: As Bernanke states in his book, between the announcement date of the policy, and the end of 2009, the Dow Jones increased by 40 percent, long term interest rate fell, initially from 3 to 2.5 percent, GDP growth was 1.3% in the 3rd quarter and 3.9 percent in the 4th quarter of 2009. Even though the growth of GDP had started, and the financial market had stabilized, unemployment was still at the high level of 10 percent at the end of 2009. Thus, on June 2010, the Federal Reserve started another round of quantitative easing (QE2), by voting to buy $600 billion of treasury securities, $75 billion each month. Bernanke speaks of “headwinds”—referring to what slowed down the effect of the monetary policy actions on the unemployment rate. He attributes such slowdown to such problems as the very slow rebound in housing construction, strict lending policies imposed on “first time” buyers, and that “Fiscal policy-at the state- local, and federal levels, was “ blowing the wrong way”. As he put it “fiscal policy has changed to an austerity mode, together with efforts to balance the budget, have had adverse effect to that of monetary policy. Moreover he argued that the debt ceiling problem together with the government shut down were barriers to the growth of the economy. Of note is the fact that the Quantitative Easing program was subject to a great deal of criticism because of the extraordinary expansion of the Federal Reserve’s balance sheet, due to its large purchases of securities. Traditionally the Federal Reserve does increase its reserve to fund its security purchases. However, since there remained further need for more expansion, the Federal Reserve resorted to the use of an “innovative” tool, referred to as the “Maturity Extension Program”: buy long term securities to push long term interest rate further down, and finance it by selling short term securities from their balance sheet, hence, the balance sheet remained the same. Subsequently however, when the Federal Reserve Later on began to run out of short term securities to sell, they started another round of quantitative easing, QE3, purchasing an open ended $40 billion a month of mortgage backed securities of Fannie, Freddie and Ginnie. The financial crisis of 2007-2009, led the federal government to plan for a major change in the financial system in order to avoid similar situations in the future. The plan dubbed as the Dodd-Frank Act had the following ingredients: First establish tougher rules for capital, liquidity, and risk management standards for both banks and non-bank Financial Institutions. Second, The Federal Reserve would supervise all financial institutions including investment banks and Insurance companies and finally, to assign to the government the power for bailing out a failing company through take over, and reorganizing it. In June 2009, some but not all of these provisions passed congress, some old rules had stayed. Commenting on the Act, Bernanke believes that one of the most important aspects of the Act was that it gave the Treasury Secretary the authority to liquidate a financial institution, handing it over to the FDIC so that it would seek a way to operate it so that such that it would “recover”. During this process FDIC can borrow from the Treasury if funds were needed. Of note is the fact that one of the Act provisions took away the Federal Reserve authority to make loans to large firms by utilizing their “unusual and exigent” clause. However, the “audit the Fed” proposal which was part of the Dodd-Fran did not pass. Instead, a provision calling for a “Review” of the lending practices of the Federal Reserve during the crisis was included. In addition, the Federal Reserve had to publish the names of the future discount window users at the end of a two years period. The ability of FDIC to guarantee the banks debt was also restricted. One other significant provision called for the creation of a Consumer Financial Protection Agency. Its function is to protect consumers from “deceitful” credit cards and mortgage practices. At the request of President Obama, the Volker Rule, later on was added to the Dodd-Frank Act. The Volker Rule prohibits the banking institution’s involvement with short term trading, such as options mortgage backed securities, and future trading. Moving forward, of note are the following effects associated with the Federal Reserve Actions: by the end of 2014, the unemployment rate had gone down to 5.7 percent; the Federal Reserve lending activities have yielded some 100 billion dollars to the US Treasury, in the form of interest and dividends; short term interest rates were at their lowest level; consumer spending was growing and homeowners were paying lower mortgage rates than previously. Moreover, the Inflation remained low, below the Federal Reserve 2% target. A great deal has happened since the “great Recession” of 2007-2009. But, a good lesson to remember is how economic policies shaped the outcome. At the end of his book, written in 2015, Bernanke speculates about the contribution of monetary policies in shaping the outcome. He states that no one can tell exactly, how much the extent of which his monetary policies have contributed to the economic recovery. In his views, a combination of “his” unconventional Quantitative Easing and the Federal Reserve transparency were a major factor for economic and job growth, as well as price stability. Ten years later, on March 2018, the anniversary of the start of the so called “great recession”, the three men who worked “non- stop” during the financial crisis of 2007-2009 to shield the US and the Global financial and economic system from the likelihood of a major economic collapse three men, Ben Bernanke, Tim Geithner, and Hank Paulson sat in an interview with NPR reviewing major events taking place during the crisis, and the tough decisions they had to make given their limited tools. They all agreed that protective financial tools available at the time, were not sufficient, outdated, and most importantly not compatible with the highly developed US and Global financial markets. Advancing the argument that they lacked the authority to change the “rules” they had but one option–, to seek congressional action on what they believed needed to get the economy out of the status of “depression”. Of interest is what they have relayed about the outcome of their action. According to the “three” policy makers, Congress, did not act right away on what they had sought, rather they faced delay after delay, which was very discouraging especially in view of the fact that economic condition continued to deteriorate. The day after this interview, The US Senate passed a bill for reforming the Dodd-Frank Act, which also passed the Congress on May, 22, 2018. The reform included measures to ease the regulations for banks with less than $250 billion in assets. In general, it removed tough measures on all banks except the ten (10) largest banks. Under the original Dodd-Frank Act the threshold was $50 billion. These institutions are no longer required to undergo the stress test, or present a living will (a plan for dissolving in case of banking disaster). Mortgage and data reporting rules under the Act would be relaxed.